There I was sitting in meditation. The pain was immense. I did not however, stretch my legs even though the pain in the knee was huge. Then suddenly, I was absorbed into a most beautiful state. It was like being inside a fluorescent bulb, nay the bulb is no match to the state I was in ….because the light is intense in a fluorescent bulb…true I was absorbed in intense light but it was not harsh like the intense light of a florescent bulb, the state I was in was extremely mild like the moonlight… so …so nice. It is very hard to describe. This is not imagination …. nor wishful thinking. This is my own experience. I was like… wow.. what’s this! I could not feel my body anymore, nor could hear anything. I was stuck in a most blissful state in the world !!! ...something like being inside a light extremely peaceful. But then… soon I felt this blissful peace of mind waning. Then I was like …Oh don’t let it go! But then again the blissfulness was too much to bear…! It soon waned off and I came back into myself …in my body… There I was sitting inside the hall of the International Vipassana Centre at Wijerama Road, Colombo 7... what on earth was that state of mind. Except.. that I recalled, that I"ve experienced the same thing before at the Kanduboda Meditation Centre about 20 years ago. This experience left me baffled. I remembered that I had the same experience when I went to learn meditation for the first time at the Kanduboda Vipassana Centre. Then after a very very long time later once again, I came to somewhat close to this state ...one morning, while meditating at home before leaving for work. I was extremely happy after the experience but completely confused….because if this happens again I knew, there is nothing I can do. Once I get stuck in this state, I could only be there stuck!!! However blissful, I knew this is not Nibbana.. and I thought, if I get stuck like this I cannot go further. I could fathom that “this” blissful state is the pure mind.. in its pristine form, but that’s it. There was no one to confirm it nor help me with proper advice. One day, while I was at Nillambe meditation centre, I happened to go through a very small book called “Basics in Meditation”. As it said “basics”, I who prided myself as a good meditator (!!) was not inclined to even read it. However, on the last day of my stay there, I had some spare time and for want of a thing to do, I just took it and started reading it. Goodness, this is not just another book on meditation! It was so very interesting and written in the simplest of the English Language, but took you step by step through mediation. ….and stopped at the place where one reaches the blissful state I’ve experienced. And the author calls this “basics”. I looked at the author at the back cover page… His picture was there, a western monk,…. I realized that he is the one that I should meet, to discuss my meditation practice with him. Then again I thought... no ....I rather go to Myanmar........ than go to a western monk, , go to the monastery of most famous monk Venerable U Panditha, the disciple of Venerable Mahasi Sayadaw, in Myanmar. So many things have come and gone since then. So many things including a Tsunami to Sri Lanka, a country that never experiences such things.. Even though the Tsunami is a horrible thing… it turned out that I had fortune turned my way because of this awful ocean wave. All due to this awful tsunami, people the world over came forward trying to help the tsunami affected people of the ravaged land. Such was their sympathy and concern that they wanted to do the best they possibly can. Some Smart Singaporeans, namely the Buddhist Fellowship of Singapore, thought, the best they could offer is to bring blessings for the ravaged country to make a turn around back to normal. 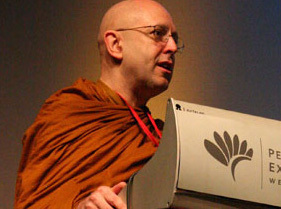 To accomplish this task they brought Ajahn Brahm with his “Mega Mettha” to this island along with a huge donation to rebuild houses of the people who lost theirs due to the tsunami. I was elated when I got to know that Ajahn Brahm was coming to Sri Lanka. Me and my cousin left our work places early to go home and dress in white and rushed to the All Ceylon Buddhist Congress Hall, where he was scheduled to address his first audience in Sri Lanka. I carried with myself a small gift for him a “mosquito repellent”, mainly as an excuse to go up to him, up to the stage, offer it to him and speak a word. I later learnt that he did not use it, as he is quite contented without such things as mosquito repellents. But he accepted it with thanks, saying that there were a few “mossies” under the chair he was sitting on !! mainly to make me happy I suppose. In that brief encounter, I inquired whether I could come to his monastery. He said “of course” and gave me the name of the website of the Buddhist Society of Western Australia (BSWA), where all the information I will need could be found. It was easy to remember www.bswa.org when I knew what the letters b.s.w.a. stood for. Since I met Ajahn Brahm, I have learnt a lot about the experiences that could happen in deep states of Samadhi, and I am no longer baffled by my own experience. It is neither an exclusive experience nor anything new. In fact, it is quite a normal happening to meditators. Many have gone beyond this stage. Ajahn Brahm explains all this, so that people won’t be confused anymore and remain in ignorance. All these stages have been clearly described by the Buddha in many suttas. It was he, Ajahn Brahm, who taught me how the Buddha has explained all these experiences in the very popular "Ana-pana Sutta." It is the most common meditation technique of all, the meditation on “in and out breath,” “Ana-pana-sati.” In this Sutta, the Buddha gives a vivid discourse on each stage a meditator would pass on the path to enlightenment and how to overcome the barriers. Now, I consider meeting Ajahn Brahm an extremely lucky circumstance in my life. Maybe I have done a really really good thing in the past.